The loss of ice shelves such as Larsen B is worrying for many reasons. It can mean a loss of habitat for creatures such as penguins. It can also cause changes in ocean circulation, temperature and salt content, due to the addition of cold, fresh water that the ice from the collapsed ice shelf provides as it floats away into the ocean and melts. Additionally, ice shelves are key in regulating the speed of glaciers on Antarctica. Ice shelves can act to hold glaciers back, but take the ice shelf away and the glaciers are free to speed up and flow straight into the ocean, and all the ice and water that they take with them will contribute to sea level rise. 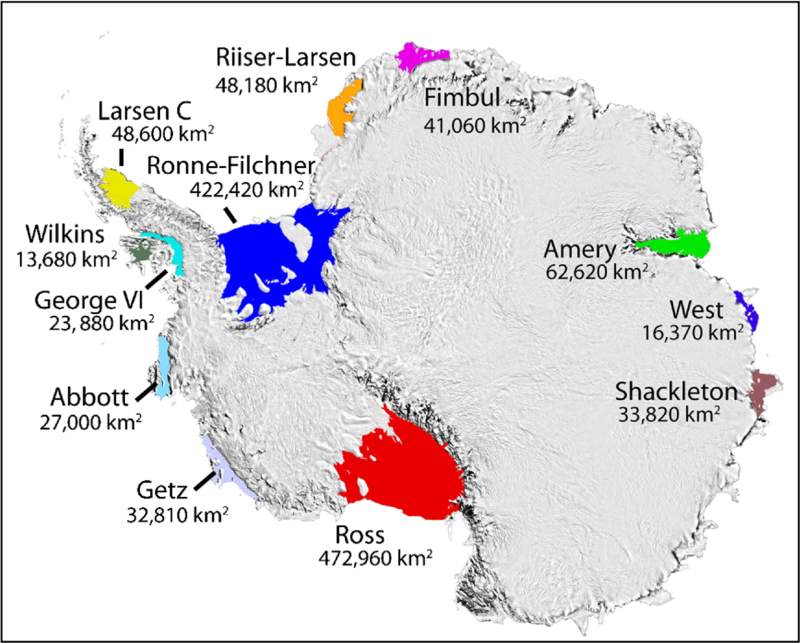 Recently these lakes have been observed on the Larsen C Ice Shelf, which is situated next to where Larsen B used to be, and this is why my work as a PhD student at the University of Reading is focusing there. The reason for this area warming so rapidly, and therefore surface melt spreading further south on the Peninsula, isn’t certain; but it is thought that atmospheric circulation and human influences on the belt of westerly winds that circle Antarctica, such as greenhouse gas emissions and ozone depletion, have played a role. The Larsen C Ice Shelf (yellow) is one of the 12 major ice shelves of Antarctica. Image courtesy of Ted Scambos, and the National Snow and Ice Data Center, University of Colorado, Boulder. The snow on Larsen C that sits on top of the ice is many metres deep, and water from snow melting at the surface will just drain away into it. For a lake to form, the snow needs to be fully saturated with water, and this would take much more than would be provided just by the melting snow. This suggests that something else must be playing a part. In order to investigate the ways in which these lakes are forming, my work involves creating a mathematical model of the way that heat is transferred through the surface of the Larsen C Ice Shelf. Through these computer simulations I have been looking at whether the water accumulates in certain areas due to the shape of the ice shelf’s surface, providing enough water to make a lake, or if processes involving the refreezing of water are having an effect. In addition to the difficulties in taking year-round measurements in a location as remote as Larsen C, we also have a lack of good satellite observations because the area is often very cloudy. Creating a mathematical model allows us to combine the information we do have, such as weather station data (which can be collected automatically once a weather station has been set up) and information from ice cores taken during one-off expeditions, with physical equations in order to simulate how these lakes form and change with time, without someone having to actually be there to observe this. The results of this work will provide information that will allow ice shelf and climate models to be improved in the future. 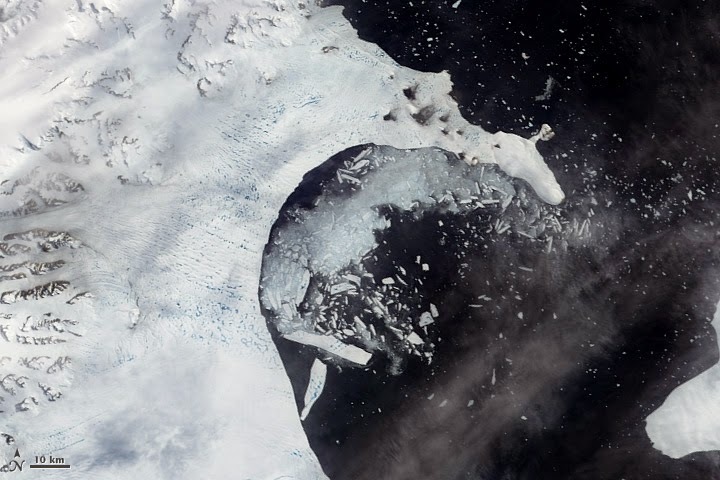 In particular, knowing how the lakes form will give new insights into the role of surface melting in ice shelf collapse, and therefore the fate of Larsen C - is it headed for a similar fate to Larsen B? Sammie Buzzard is a PhD student in the department of Meteorology at the University of Reading. After completing a Master's degree in mathematics she is now researching surface melt on the Larsen C Ice Shelf. She blogs about polar science, life as a PhD student and cake (because cake is essential for research) at Ice and Icing and can be found tweeting at @treacherousbuzz. IPCC Fourth Assessment Report: Climate Change 2007 , Working Group II: Impacts, Adaptation and Vulnerability, 15.6.3.